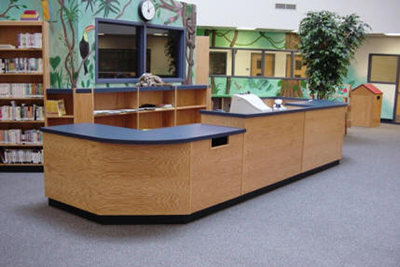 Sectional Charging Counters may be made of any arrangements desired. Plastic tops are continuous with as few joints as possible. 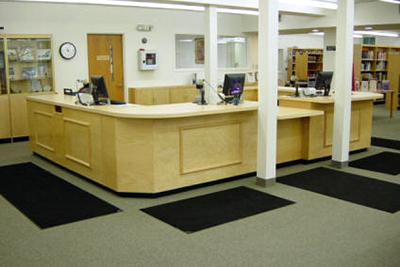 All units are 36" wide, 25 1/4" deep, 39" high - supplied in 33" heights or 30" width (when specified). Standard banding is square edge with plastic tops and edge. Other styles are available upon request. 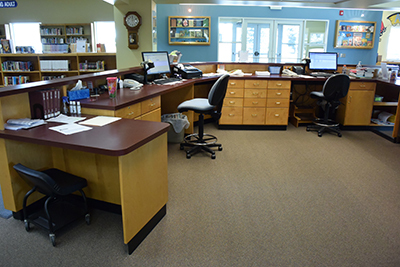 Most units are available in closed base or knee space. W.C. Heller's detailed craftmanship shows throughout the Card Files. No. LCC-IK - CHARGING UNIT - Comes with 8 removable trays for 3 x 5 cards, removable top (used for pull out shelf) and foot rest. No. LCC-1 - CHARGING UNIT - (Not shown), same but closed base with 1 adjustable shelf. No. LCC-3K - CHARGING CARD UNIT - Two card slots with locking drawer for depos­it. Well for machine ru1d foot rest. No. 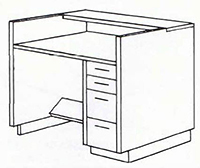 LCC-2 -CASH OR DRAWER UNIT - has solid top with two drawers under-1 for cash with lock and l adjustable shelf. No. LCC-2K - CASH OR DRAWER UNIT -(Not Shown), same but with open base and footrest. No. 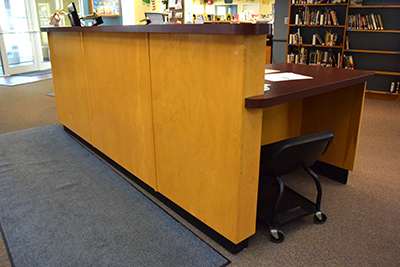 LCC-4 - OPEN SHELF UNIT - Solid top with 2 adjustable shelves. No. LCC-5K - WELL UNIT - has recessed top for typewriter or computer. Often used as desk, power outlet available. No.LCC-5-WELL UNIT-(Not shown), same but closed base with 1 adjustable shelf. No. 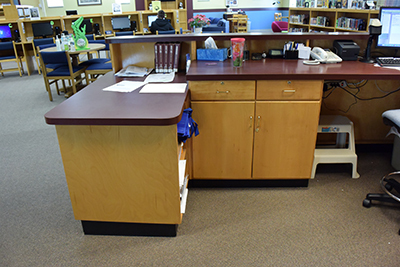 LCC-7TCO OPE TRIANGLE CORNER UNIT - open front with fixed shelf for books or displays. No. LCC-7TC - TRIANGLE CORNER UNIT - closed front. No. 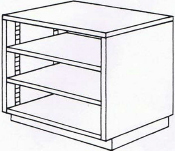 LCC-6 - CUPBOARD UNIT - solid top, 2 hinged doors with lock. 1 adjustable shelf. No. LCC-7SC - SQUARE CORNER UNIT - closed front. No. 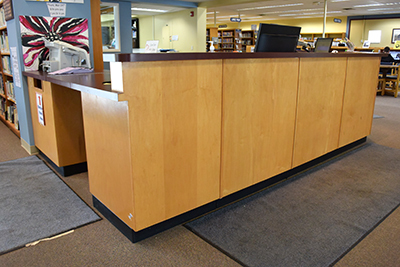 LCC-11 - BOOK RETURN UNIT - Slot is in front for easy book return, for use with or without No. DBT-36 Depressable Book Truck. No. LCC-l lD- BOOK RETURN UNIT WITH DRAWER - (Not shown), samebut closed base, 13" deep pull-out drawer on drawer slides, with lock. No. 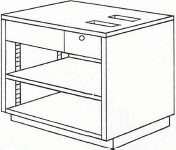 CF-60L - CARD FILE - 60 drawer with leg base. No. CF-60S-CARD FILE-60 drawer unit (not shown) same as above but with solid closed base. No. 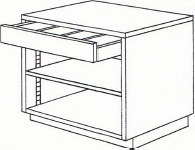 LCC-10 - DRAWER UNIT - With l adjustable shelf. Can be used with optional trays for 3 x 5 cards. No. LCC-lOK - DRAWER UNIT - (Not shown). same but open base with footrest. 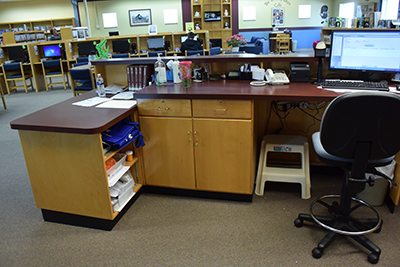 Also used as desk with a high base chair. No. LCC-12 - STORAGE CUPBOARD UNIT - solid top, 2 sliding doors with lock. One adjustable shelf. No. LCC-13 - DRAWER AND STORAGE UNIT - I adjustable shelf. 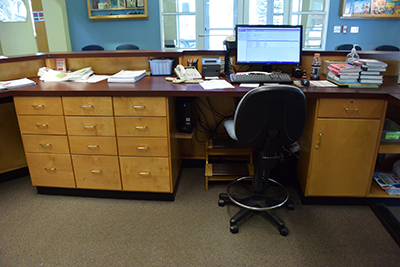 2 full width stor­age drawers and trays can be added. No. LCC- 15K - CHARGE-DISCHARGE UNIT - 5 trays for 3 x 5 cards and card slots with drawer lock, with footrest. No. LCC-15 - CHARGE-DISCHARGE UNIT - (Not shown), same but closed base with adjustable shelf. No. LCC-14-CARD STATION UNIT- full top, 2 slots for deposit of cards, lock on drawer with 1 adjustable shelf. No. LCC-14K - CARD STATION UNIT - (Not shown), same but open base with footrest. 4 drawers for storage of paper, pencils, etc. Power outlet available. No. LCC-50AS - ADJUST ABLE SHELF - for any closed base unit (not shown).